This is one slot machine that pretty much guarantees a winner every time. Definitely a crowd pleasure as they see the person inside trying to grab your coupons, money, flyers, etc as it swirls around inside. Being inflatable, this unit can be setup almost anywhere. 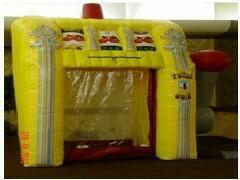 Perfect for Carnivals, School Events, Casino Nights, Church Festivals, Promotions, Conventions, Grand Openings and more.